It is impossible to exclude oxygen from fires. Heat is considered a constant. However, a reduction in fuel will reduce the total energy output. Fuel is anything capable of burning and sustaining combustion in the present of oxygen when heat is applied to it. Bark, especially if it is loose, fibrous or stringy. Litter (dead leaves, twigs and bits of bark found on the ground). Veldfires all start small but their rate of spread and heat generated (intensity) depends on the weather, the terrain and the condition of the available fuel. The more intense the veldfire the more difficult it is to control. The only aspect that can be influenced is the amount of fuel present. Doubling the fuel load will double the rate of spread, resulting in the intensity of the fire increasing fourfold. Fuel levels of 7.5 tons per hectare are relatively easy to control. In fully cured (dried) grass, the flame height will be 2 metres. This is the heat generated by a fire. This heat affects you well before the flames reach you. If you are not protected, radiant heat can kill you by causing heat stroke. Radiant heat only travels in straight lines. What can you do to reduce your exposure to veldfire? Do you live in a veldfire-prone area? Have you identified and dealt with high fire risks around your property? How will you stay informed of fire conditions on high fire risk days? Do you have an adequate and reliable source of water? What assistance can you expect if there is a veldfire? If you decide to evacuate, what route will you use and what will you take with you? If you decide to stay, do you know how to protect yourself from radiant heat? Do you have appropriate clothes ready for everyone if decide to stay? Some parts of your property will be safer. Gentle slopes are safer than steep slopes. The bottom of a slope is safer than the top of a slope. Burning embers landing on or near the house. Radiant heat ahead of the fire. The main source of ignition in a house is burning embers. Houses do not have to be specially built to protect you from a fire. No one building feature will guarantee safety. Reducing fuel will reduce the threat. Reduce fuels ahead of the fire season. Beware of ‘fingers’ of vegetation that penetrate your property. 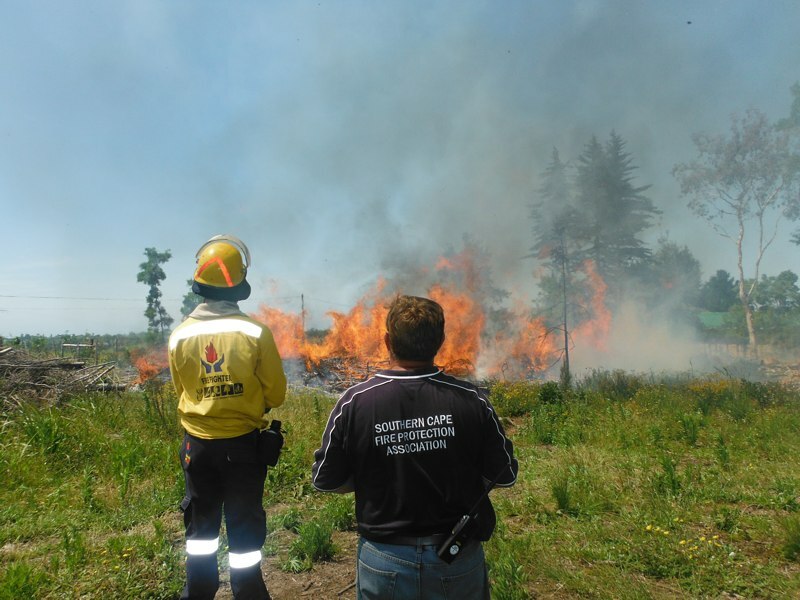 Firebreaks are areas of reduced fuel allowing access of fire fighters and equipment to attack an oncoming fire. Do not rely on a firebreak to stop a veldfire. The effectiveness of a firebreak depends on its positioning and on regular maintenance. Incorporate existing features into firebreaks. Build stone walls as a radiant heat shield. Position lawns and other low fire risk features between houses and where a veldfire is most likely to approach from. Maintain green lawns, cultivated soils or gravelled areas beneath trees. Remove dead trees, branches and leaves. Prune lower branches to avoid continuous fuel from ground to tree canopy. Remove trees close to house or overhanging or touching a house. Ensure trees are a safe distance from buildings and power lines. Avoid dense clumps of trees and remove highly flammable trees. Maintain building protection zones around all buildings. 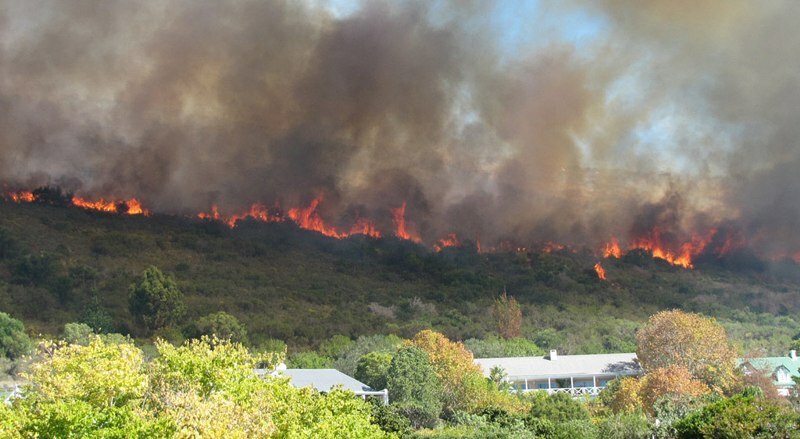 Your plan should cover both staying and defending your property or leaving it ahead of the veldfire. What actions will you take before the veldfire arrives? Where will you shelter when the fire front passes? What actions will you take after veldfire passes? What will you do with your pets? What will you do when you return? Plan to use fallow fields, well grazed fields or areas with bare ground. Where possible, have shade and water available for valuable stock, especially breeding stock. Remove branches that could cause power line short circuits and check electrical installations regularly. Restrict the use of farm machinery on days when the fire danger is high. Take great care when using welding, cutting and grinding equipment. 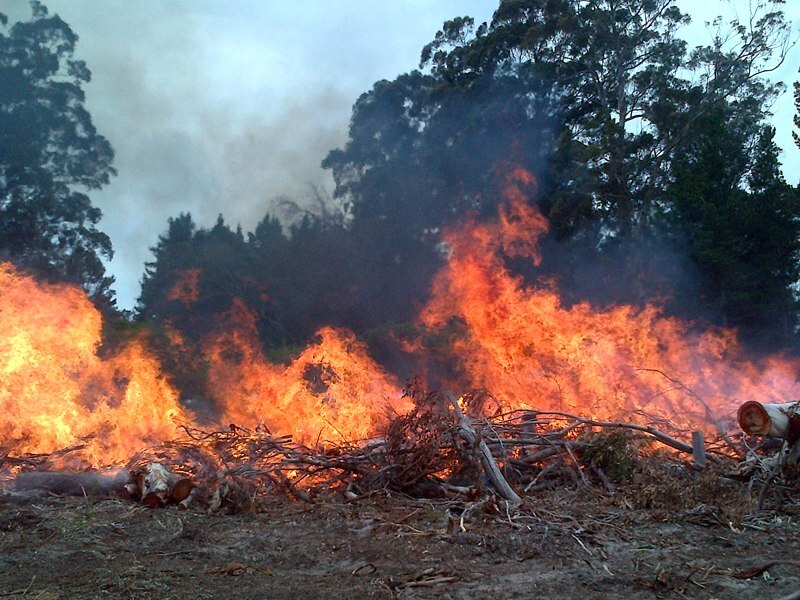 Establish firebreaks between your land and roads or railways. Adopt safety standards for smoking, burning rubbish and disposal of hot ash. Make sure all fires are extinguished properly before leaving – never leave a fire unattended. Have your own well-maintained fire fighting equipment on a farm. 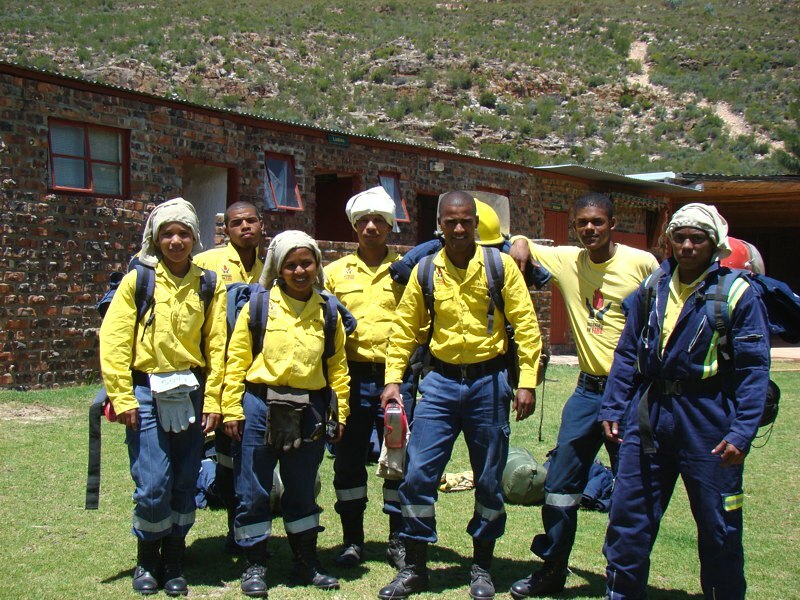 Train your staff in firefighting techniques. Make decisions early – carry out the planned response, that is, to evacuate or to stay? Move livestock to safer locations. Listen to radio for news. Wet garden and house especially on the side of the approaching fire. Fill baths, buckets and dust bins with water in case the water supply fails and have mops handy. Seal any gaps between doors and floor using wet towels or similar items. Close up the house and screen off the windows. If you decide to stay, go indoors when the fire arrives and remain there until the fire front has passed. Take fire hoses and other fire fighting equipment indoors with you. Patrol the house interior including checking the roof cavity and extinguish any small fires immediately. Remain vigilant after the fire front has passed. A water pump – petrol or diesel (electricity supply may be disrupted during a fire). Fire beaters, rake-hoes and shovels. Buckets (preferably metal) and mops. Sturdy boots or shoes and woollen socks. Hat with a wide brim. Goggles to protect eyes from smoke. Long sleeved shirts and trousers. Large handkerchiefs to cover nose and mouth. NB: All protective clothing should be made of natural fibres. construct firebreaks adjacent to the property. consider removing branches or trees that overhang buildings. remove dead and dry branches from trees. install a sprinkler system in your garden and on your roof. install hose fittings that are fire-proof. know what radio station will carry news of veldfires. make sure your property can be easily located by the fire brigade. store fuels and paints in a single place away from the house. remove dead leaves and dry vegetation and litter from the garden. attach hoses to taps when the fire danger is high. check pumps on a daily basis when fire danger is high. ensure that sufficient drinking water is available.